One of the most popular cuisines in the UK is undoubtedly Indian, with thousands of different style venues all over the country. Indian curry houses, takeaways, fine dining and street food restaurants – they all represent different aspects of the rich Indian cuisine. We can say that Indian food is well covered here. Not all Indian restaurants have a big drinks menu. Some eateries only serve soft drinks, but as we know, India has a good tradition in producing and consuming alcoholic drinks too (check our article Traditional Indian drinks for more info on the topic). 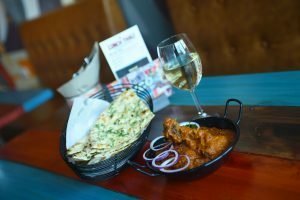 This is why a growing number of Indian venues offer a selection of both alcoholic and non-alcoholic drinks. They can be originating from India, Indian inspired or simply go well with Indian food. Masala chai is a part of the everyday street life of India and a must try. 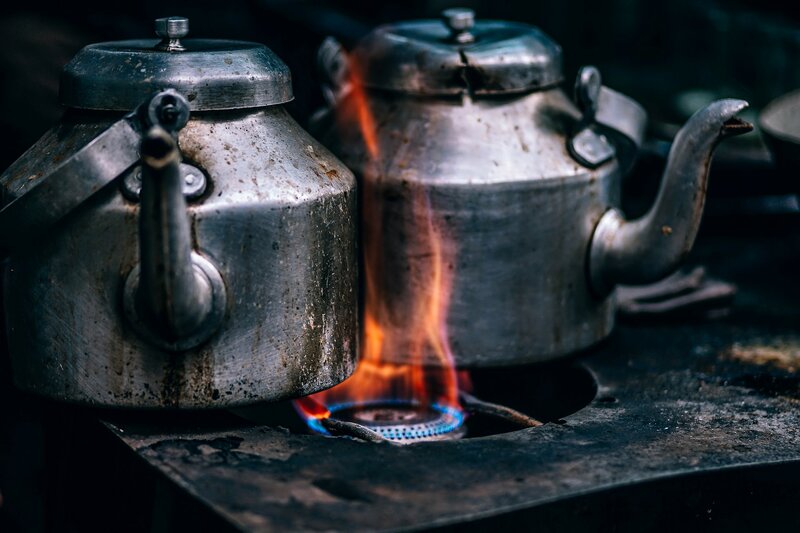 In India, the people who prepare and sell Indian masala tea on streets or small roadside shops are called Chaiwalas. Did you know that sometimes chaiwalas perform tricks to sell their chai? It is called the “metre-pour”, where the chaiwala blends the chai by pouring it back and forth between the pots at two arm’s length apart. Another popular traditional Indian drink is Lassi. It’s a yoghurt-based drink that could be salty or sweet (mango lassi). As it is quite filling, we don’t recommend having it with a large meal. 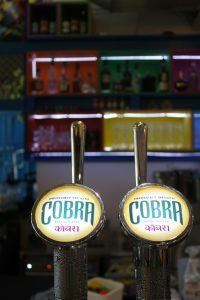 Indian lagers are the most popular type of beer served in the Indian restaurants in the UK. The big names here are Cobra and Kingfisher. As for the IPA, it can be found in English pubs and some Indian restaurants, but not all. Its history goes back to the late 18th century when Bow Brewery started exporting their pale ale to India. In the 19th century the product – which by this time had become known as India Pale Ale (IPA) – became popular in England and later on in Canada and the USA. If you think that curry goes well with beer, you should try pairing it with wine! There is a good wine match for every curry, depending on the main ingredients, the intensity of its flavours and how spicy it is. If you’re not sure what to choose, ask your waiter for advice. Indians can be called whiskey-drinkers: both local and international brands are popular in the country. The drink was introduced in India by the British in the 19th century. While there are many local brands, most of them are not prepared in the same way as Scottish whiskey for example. Almost 90% of the Indian whiskeys are a blend of neutral molasses-based spirits and a small portion of traditional malt whiskey. These are our top 5 drinks to order in an Indian restaurant. If you don’t find your favourite among them, make sure to check our next article about the best cocktails with an Indian twist!